In December 1998, the long-awaited opening of Baku's new Musical Comedy Theater finally took place. An earlier theater of the same name was built on the same site by the esteemed Oil Baron-turned-philanthropist Haji Zeynal-abdin Taghiyev more than a century ago. The new theater's operatic season opened with the recasting of one of Azerbaijan's most famous comedies, Uzeyir Hajibeyov's (pronounced oo-ZEH-yir hah-jee-BEH-yov) "O Olmasin, Bu Olsun" (If Not That One, Then This One) or familiarly known by the name of its protagonist, "Mashadi Ibad." Azerbaijan International's Azeri Editor Abulfazl Bahadori analyzes why this satirical comedy so popular in the early part of the century is so relevant today as once again, Azerbaijan attempts to integrate into a capitalist society, this time from a socialist system, rather than a feudalist system which was the case at the turn of the last century. Uzeyir Hajibeyov (1885-1948) was a multi-talented genius who excelled in depicting the social issues that concerned society the most, not only in his musical compositions but also in his writings and plays. The operatic comedy, "O Olmasin, Bu Olsun" (If Not That One, Then This One) is his finest work in this respect. It was written in 1910 and first staged in 1911. Since then, it has been translated into various languages and even staged outside of Azerbaijan or what was once the Soviet Union. In 1956, the play was adapted for screen by Azerbaijani film producer Husein Sayidzade. It turned out to be the most successful Azerbaijani comedy ever produced on screen-a distinction it holds to this day. The filmmakers even succeeded in getting the film distributed outside of the Soviet Union. For example, in Tabriz, my hometown, there was a small, old movie theater (Cinema Iran) which once devoted the entire month of Ramadan to "Mashadi Ibad." I remember my parents taking me there, and the theater being absolutely packed. Consider the historical and geographical context of the play. The first two decades of the 20th century in the region were very uncertain and turbulent. Baku, with its enormous resources of oil, became one of the most vibrant cities of the Russian empire. Then, as now, the city was full of contradictions. Both capitalist and working class elements lived side by side causing irreconcilable differences. At the turn of the century, capitalism was undermining the traditional feudal wealth and social status of land owners in the Russian Empire. Hajibeyov's play opens with Rustam Bey, an aristocratic landowner who has become bankrupt. Strapped for cash, he feels he has no choice but to do the unthinkable: marry off his only beloved daughter, Gulnaz, to a local merchant. Enter Mashadi Ibad, an uneducated merchant who has recently acquired considerable wealth, but who just happens to be quite old-fashioned and at least 30 years older than the beautiful Gulnaz. Hajibeyov was always a stalwart supporter of women's rights. At the age of four, he is said to have complained bitterly to his mother about the veil she was required to wear whenever she went out into the traditional Muslim society. He felt it covered her pretty face and he didn't want to accompany her. As years passed, his sensitivity to the plight of women only intensified. Hajibeyov must be hailed as one of the most progressive writers of Azerbaijan, given that he wrote many of his works when women in many Western countries didn't even have the right to vote. Of course, Gulnaz refuses to marry Mashadi. The first time he comes to visit her family bearing gifts, we see the rich merchant mulling over the contradictions of his life compared to hers. Though he has more cash than the girl's father does, he is not of the same class. He does not live in a mansion, nor is he acquainted with a luxurious lifestyle. While waiting in another room, he wonders how a girl brought up in such style could ever be confined to his dark home and limited social life. "Well," he concludes, "if she revolts, I'll imprison her! She should be scared of me. The more a wife is frightened of her husband, the more she will obey him." From the early scenes of the play, we expect Mashadi to be a real monster, but Hajibeyov is not given to drawing his characters in black and white. He creates complex portraits and soon reveals Mashadi's naive and very human side. Mashadi's only fault turns out to be that he is rather old-fashioned and out of touch with the rapidly changing times. Left: The new Musical Comedy Theatre on opening night, December 8, 1998. Photo: Rafig Bagirov. Right: Curtain call at the Inaugural performance of "Mashadi Ibad" in the new Musical Comedy Theater (December 8, 1998). Mashadi Ibad was played by Hajibaba Bagirov. Photo: Rafig Bagirov. The part of the play that best reveals the social issues of the day is the engagement dinner party hosted by the father of the bride-to-be, Rustam Bey. Every guest at the dinner represents a different social or political sector of Baku society. Mashadi himself represents a traditional Azeri and hence the old values. However, Hajibeyov soon creates a sympathetic nostalgia for him and the traditions that are destined to die away. For example, Mashadi refuses to join others at a table where alcoholic beverages are being served, choosing rather to sit in a corner sipping tea. He even uses the edge of his long coat to shake hands with those who have touched the bottle. Most of the guests, who have become rather tipsy, are bragging about themselves and their "intelligence." Mashadi is too uneducated to understand some of the topics but his short comments expose the shallowness of the arrogant guests. Such satire is common throughout the play. Hajibeyov does not promote Western values at the expense of traditional ones. He resists blindly imitating European ways and uses Mashadi as his spokesman. Another guest at the dinner party is Gochu Askar, a racketeer whose sole purpose at the party is to ensure its security. In fact, during the first years of this century, so many uprisings in Czarist Russia served to weaken the distant parts of the Empire, including Azerbaijan, so anarchy was left to rule in Baku. Every district was controlled by a different mafia. Mashadi, like many other businessmen, had to bribe his own district's racketeer in order to survive. At the dinner party, Hajibeyov acknowledges this reality of life by bestowing upon Gochu Askar the honor of rising to offer the first toast. The most arrogant and narrow-minded guest is Reza Bey. He is a true Pan-Turkist. He butchers the Azeri language, mixing it up with Ottoman Turkish so that no one can understand him. This, in turn, frustrates and offends him. Hajibeyov mocks the strong Turkic elements in the newly born nationalism that was developing in Azerbaijan despite the fact that it was promoted by intellectuals who had studied in Turkey. Hajibeyov believed in healthy and natural exchange among cultures, but always tried to shield Azerbaijani music and culture from harmful outside influences. For example, he cautioned traditional mugham (pronounced moo-GAHM) singers not to improvise as Persian singers did. He also warned against widening the gap between written and oral forms of Azeri by adopting the ostentatious and haughty Ottoman style. 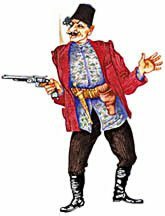 Another character, Hasan Bey, is a flamboyant westernized alcoholic who confuses Azeri with French and Russian. He manages to offend Mashadi when at great length, he elaborates about the new Darwinian theory of evolution, suggesting that Mashadi's ape-like features are enough to confirm the controversial theory. "To prove Darwin right, one need not go all the way to Africa in search of apes that look like man," says Hasan Bey. "It is sufficient to study Mashadi in our own little gathering." And then Hasan Bey provokes his host by further inquiring, "So how is it that Rustam Bey is giving his beautiful daughter, his only daughter, to an ugly man like Mashadi?" Hasan Bey goes on to answer his rhetorical question: "Maybe, for his wealth and money! No, that cannot be true! I think it's simply because Mashadi is a good Muslim!" And with that challenge, Mashadi explodes. The dinner party turns into a barroom brawl and Rustam Bey's house becomes a battlefield. The party is over. The second most important character is Hambal. The word itself, in Azeri, refers to a cheap laborer who carries heavy objects on his back. Hajibeyov doesn't even give this character a name, but simply calls him Hambal and uses him to expose the depth of discrimination against the working class. His insights were exactly on target. Within less than ten years, one of the bloodiest revolutions in the history of mankind would erupt as a consequence of these conditions. As the story develops, Mashadi becomes obsessed with seeing his betrothed and tries to carry out the traditional practice of "adakhli bazliq" (secret rendezvous). In those days, a girl could not simply walk out of her father's house to visit her boyfriend, nor could the boy simply knock at the door and walk in. Therefore, secret meetings had to be arranged. Traditionally, the lover usually chose a quiet time during the day or night, and simply climbed over the courtyard wall of the girl's home. As Mashadi is too old to do this, he seeks to hire a hambal. When he beckons for one, many come running. Hajibeyov uses this scene to depict the depth of poverty and unemployment that existed in society. The oil wealth in Baku had attracted many poor people from Iranian Azerbaijan who spoke the same language and could cross the border freely to earn a little money through cheap labor. Hence Hambal speaks with a southern Azeri accent. To help Mashadi fulfill his desire to see Gulnaz, the skinny, malnourished Hambal bends down and the fat, heavy Mashadi steps up on his back to peer over the courtyard wall. He does catch a glimpse of her. But to his amazement, she is not alone. Gulnaz is with a handsome young man, Sarvar, who announces to Mashadi that he is Gulnaz' fiancé. Of course, Mashadi becomes enraged, feeling totally betrayed by Rustam Bey, who has already charged him a lot of money for his daughter. He calls for help. News travels fast and all the opportunists who were at the previous night's dinner party rush to assist, or rather "rip-off," the devastated, but naïve, merchant. Mashadi pays large sums to all of them, but still denies a single penny to the character that has helped him the most, Hambal. Meanwhile, Sarvar meets with Gulnaz' father. They decide to tell Mashadi that he is really the girl's uncle and that he was only joking when he announced that he was her true lover. Mashadi is satisfied. The wedding night arrives. After the traditional ceremonies, the veiled bride is escorted to Mashadi's room. Finally, he is alone with her. He does his best to create a romantic atmosphere by lighting candles and singing romantic Persian poetry. The moment arrives when he begins to lift the veil from her face-which is when he gets the shock of his life. "O, my God! Who are you? You're not the girl! You're that guy again!" Left: Mashadi Ibad was played by Hajibaba Baghirov, "People's Artist". Instead of Gulnaz, Sarvar is under the veil. He loses no time and sticks a fake gun to Mashadi's head, forcing him to annul the marriage certificate and sign another one. Mashadi readily complies and hence the title; "If not that one, then this one." It all ends happily as Mashadi marries the chubby maid Sanam who he preferred anyway and who fancied him as well. And Gulnaz gets to marry her true love, Sarvar. The only one who doesn't win out in the end is Hambal who never sees a single penny for all his efforts. He winds up being the epitome, not of cheap labor, but of slavery itself. Abulfazi Bahadori is the Azeri editor of Azerbaijan International. He has enjoyed performances of "Mashadi Ibad" since childhood.